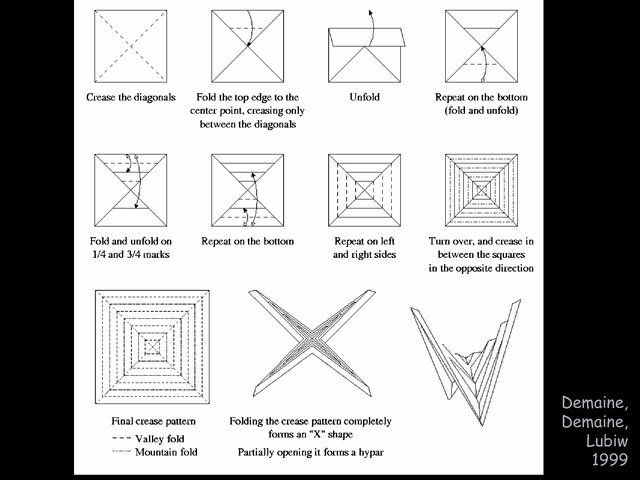 [+] Pleat folding: “Hyperbolic paraboloid”, circular pleat, self-folding origami, plastic deformation and elastic memory; triangulation, interval arithmetic; how paper folds between creases, ruled surfaces, torsal, straight creases stay straight, polygons stay flat; nonexistence. Inflation: Teabag problem, inflating polyhedra. 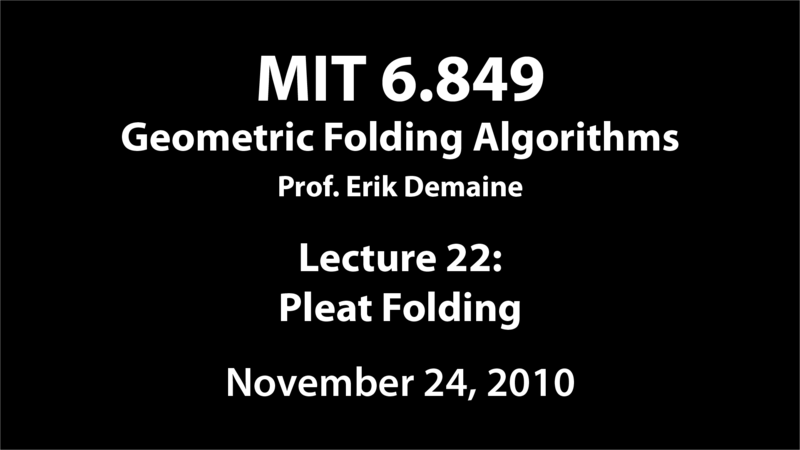 Curved creases: Recreating David Huffman's curved-crease folding. 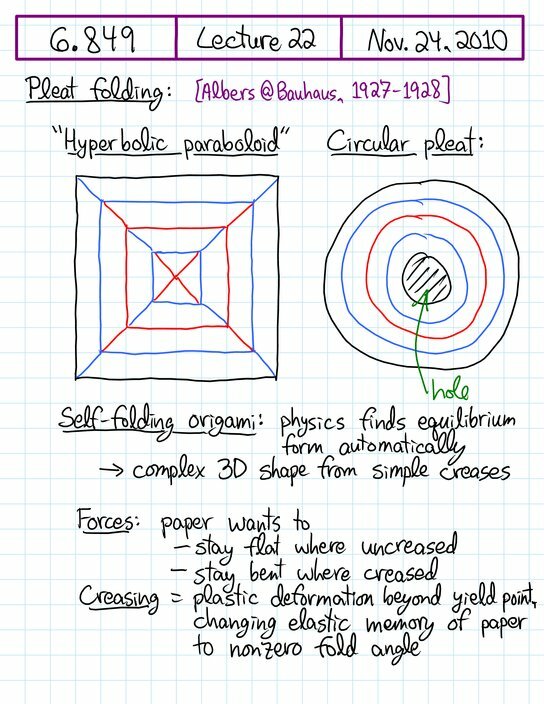 This lecture is primarily about pleat folding, specifically the so-called “hyperbolic paraboloid” model common in origami and originating at the Bauhaus in the late 1920s. Surprisingly, this origami model does not exist: it's impossible to fold anything nonflat with a crease pattern consisting of concentric squares and diagonals. We'll prove this, using a new theory for how paper folds in between creases, in particular showing that straight creases stay straight when folded, and interior polygons stay flat when folded. By contrast, we'll show how the “hyperbolic paraboloid” folds fine after adding specific diagonal creases to the trapezoidal faces. Afterward, we'll briefly look at a couple of related topics: how to maximally inflate a teabag or other polyhedral surface by folding, and what kind of foldings are possible with curved creases. On the latter topic, I'll overview a big ongoing project in which we're trying to reconstruct the mathematics underlying a beautiful series of sculptures folded by David Huffman from the 1970s–1990s.